In the year of 2035, scientists at the HADRONICS research facility managed to successfully create a WORMHOLE. It connected the Earth to an alien planet far away in the universe. However, shortly afterwards, hostile aliens invaded the laboratory and kidnapped the Professor, who is the only person capable of stopping the experiment. A rescue mission was started and YOU were chosen to save the world. Equipped with a rocket-driven Hazmat suit, you have to make your way through the research facilities, go through the WORMHOLE and rescue the Professor. 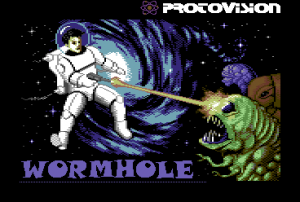 WORMHOLE is a side-scrolling jump 'n shoot game for the legendary Commodore 64. It contains 15 challenging, diversified levels, divided into three different chapters. The game can be played as one- or two player game (alternating, only one active player at a time) using one or two joysticks, optionally. Three different weapon systems (pistol, lasergun and rocket launcher) are available in the game that help to eliminate various types of alien creatures on your way through the dangerous environment of the research facilities and the alien planet. In addition, you can collect bombs that can be detonated either via remote control or by time fuze. Also make sure to collect additional fuel for your horizontal and vertical rocket drive. The built-in trainer helps you to familiarize with the different levels, and to prepare yourself for the next attempt on a new highscore! Another game to be released soon by Protovision is Wormhole from TRS! You’re an agent on a super secret, super dangerous and world-depending-on-it-important mission. You have to shoot and run your way through the 3 game worlds and rescue the professor, the only person in the multiverse who can save the earth.